What does your body good? Here’s one simple way to find out. I’ve been talking to quite a few clients lately about how to decipher what’s actually good for your body and health. It can sometimes feel like your body’s giving you mixed messages or that you intellectually know something but have cravings and urges that tell you otherwise. Signs and symptoms after eating or using a product, like fatigue, bloating, acne breakout or digestive issues, tell us immediately that there’s something not right. But what if you don’t have anything obvious to tell you – i.e. instead of your body “screaming” at you, maybe it’s “whispering” ever so softly. What makes it even more confusing is when seemingly “healthy” foods or products start to give you symptoms. How are you supposed to tell what’s actually good for you if you’re experiencing and hearing something totally different?! In my practice, it’s part of my job to help you figure that out – and yes, we can dig deep by using functional nutrition tools, fancy labwork and analyses with your doctor to do this, which are absolutely helpful in many cases but can also dig deep into your wallet. There’s one BIG rule of thumb that I always use for myself and all of my clients. It doesn’t require expensive lab panels, or a month of being on an elimination diet to benefit… it takes seconds to implement and can be done from anywhere at anytime. There is a core truth about our connection to mother nature and the planet, and it’s this – if something is good for the planet (or at least does not harm it), it’s probably good for you. And if it’s bad for the planet, then it’s most definitely bad for you too. The sun not only gives life to this planet, but exposure has been found to be good for your health, circadian rhythm, mental status, oh yea and that little ole vitamin called D.
Time spent in nature has been proven to improve depression, immunity, and sleep. Communities that live and eat in close relationship to the land have more diverse microbiomes (the bacteria inside and on their bodies) which we are just discovering has a LOT to do with our overall health, and near nonexistent chronic disease. Chemical soup. Example: DDT. It was banned because it persists in the environment, accumulates in fatty tissues, and can cause adverse health effects on wildlife – meaning animals died from it. It’s also linked to cancer and infertility in humans. Growing practices. Modern day farming practices such as monocropping and use of harsh pesticides with GMO crop have destroyed the integrity of the soil and the ecosystem within it – thereby depleting nutrient density, and loading us up full of chemicals that have an insidious effect on our health. Plastic nation. Man oh man. You’ve probably heard about the giant island of garbage floating in the ocean, or how those microbeads in your face wash wreaked havoc on water systems. These plastics also have an endocrine disrupting effect on humans – leading to hormonal imbalance and chronic disease, even cancer. I’m not trying to guilt you or overwhelm you, although I assure you this is all very overwhelming stuff! I want to empower you to make smart, thoughtful and healthy decisions. If you haven’t noticed, it can often be easier to tell if something is good or bad for someone else because you’re not so “in it.” For example, it’s easy for you to see that your friend’s lover is a terrible partner for them, or that your sister’s job is killing her slowly and it’s better to walk away. Or how helpful it can be to spend some needed time away from doing a project such as writing if you feel stuck or frustrated. How many time have you had an eureka moment in the shower or in your dreams? Creating a healthy distance – physical, mental, emotional – from the situation can be incredibly empowering and enlightening. All of a sudden it’s easier to make decisions from a place of clarity. This is what you do when you ask a question like the above – you create an opportunity to explore in a nonjudgmental way, minus the emotional baggage. It takes you out of your body, and assists you in becoming aware of the bigger picture. It’s not about what you can or cannot afford to do… access to choices can absolutely be a barrier for some. Any small step will make an impact on your health, so focus on what you can do. 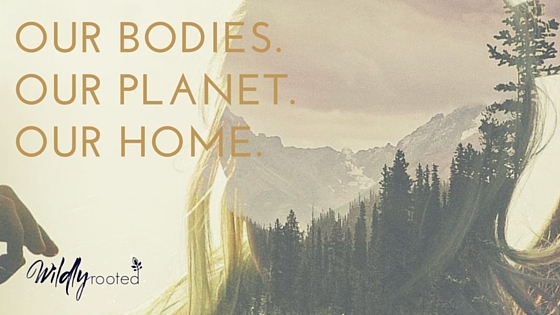 Our bodies and our planet are our only home – it’s time to treat them like it. Is this method foolproof? Of course not. But I know you’re wise enough to know when it can be useful for you. The point is not to get too heady about this – keep it simple! So, next time you’re having a “should I” moment, try asking: What would Mother Earth choose?